Three years ago, Elias Gurmu and his wife, Sarina Prabasi, spotted a shuttered shoe repair shop in their new Manhattan neighborhood. They had moved only a year earlier from Addis Ababa, Ethiopia . And they thought the tiny vacant space was the right spot for an Ethiopian coffee shop. Their gentrifying pocket of Washington Heights, dubbed “Hudson Heights” by realtors, had no coffeehouses despite New York City’s more than 280 Starbucks and a slew of small boutique coffee chains like Stumptown Coffee Roasters and Blue Bottle Coffee. The closest specialty coffee shop, a Starbucks , was a seven-minute walk south, a world away by New York City standards. Gurmu, a serial entrepreneur, and Prabasi, both 42 years old, took a gamble. They invested their savings, bolstered by personal credit cards, to open the street-level Café Buunni. It’s the only Ethiopian-owned (technically co-owned, as Prabasi is originally from Nepal) and -run coffee shop in New York City. But it’s one of a dozen coffee houses that have been popping up across the country, including in Chicago; Washington, DC; Minnesota’s Twin Cities; and San Francisco. The trend is a sign of the growing number of Ethiopian immigrants in the US. It’s also a testament to the country’s gourmet coffee revolution . And that, Prabasi says, is thanks – at least partly – to Starbucks. Among coffee aficionados and those who love to hate big business, Starbucks is a popular punching bag. When its shops first burst onto the US scene in 1994, Starbucks was considered a funky new coffeehouse concept from Seattle, home of Nirvana and grunge music. Twenty years later, with approximately 11,450 locations in the US alone, it’s often thought of as soulless, its cachet a few notches above McDonald’s. Plenty of small coffee shops feared they would end up closing when Starbucks came to town – the company faced protests on some towns, as well as complaints from smaller competitors – but fear of operating near a Starbucks has largely dissipated . Unlike the nearby Washington Heights Starbucks, Café Buunni has a distinct neighborhood feel. The full-bodied aromas of Yirgacheffe, Harrar, Limu and other prized Ethiopian coffees have long replaced the smells of leather and shoe polish. The towering Gurmu is often stationed behind the gleaming espresso machine, young baristas working around him. From its first week in operation, the cafe has become a neighborhood sensation. It is nearly always full, with a line out the door on weekday mornings and weekends, and goes through 200lbs of coffee a week. It has also exceeded all of its owners’ financial expectations, breaking even in a mere six months and turning a profit soon afterward, Prabasi says. Its prices are on par with Starbucks’: the slightly sweet Ethiopian macchiato is a house specialty and sells for $3.50, cappuccinos are $4 and a pound of Buunni’s freshly roasted Ethiopian beans costs $15. The corporate behemoth normalized the $4 to $5 cuppa and introduced espresso drinks to mainstream America, she says. It cultivated a large customer base of more discerning coffee drinkers, opening up the market and allowing small chains and independently owned coffee shops like Buunni to compete. For some customers, anyway, Starbucks has acted as a gateway into the world of craft coffee, with customers expanding their search of the best cup they can find. Starbucks also has educated American consumers to coffee’s origins, Prabasi adds. “Starbucks, to their great credit, has done a really good job of putting Ethiopia on the map,” says Dan Cox, the president and owner of Coffee Analysts in Burlington, Vermont. For many Americans, Yirgacheffe and other Ethiopian coffees were first introduced through the safe and familiar vehicle of Starbucks. When Starbucks’s iconic green signs began glow throughout the US’ major cities in the mid-1990s, the US imported an average of $24m worth of Ethiopian beans. The amounts have steadily increased to $93m last year, according to the US Department of Agriculture. Buunni Café is hardly the only independent coffee house to thank Starbucks, either. Dawit Bekele, owner of Royal Coffee in Chicago, says that the corner Starbucks has actually helped his business. “People come to Starbucks and then they find us, taste our coffee, and then become our loyal customers,” Bekele, who opened Royal Coffee six years ago, says with a chuckle. In Washington DC, Kenfe Bellay, the proprietor of Sidamo Coffee and Tea, notes that his customers, who he describes as a mix of “regular Americans”, have been increasingly open to Ethiopian coffee since he first opened nine years ago. In San Francisco, the aunt and niece team behind Bereka Coffee – which opened in 2013 and specializes in custom blend drip Ethiopian coffees – enjoys a steady flow of customers despite a Starbucks around the corner. Even in Seattle, the epicenter of coffee culture and home to Starbucks, Solomon Dubie, the son of two Ethiopian immigrants, is confidently converting his minimart store into an Ethiopian coffeehouse, to be called Café Avole, slated to open early this summer. Starbucks isn’t even on his radar as possible competition. “They have a great setup, a great system that works for them, but their coffee is not on the specialty end,” Dubie says. “Here in Seattle, we’re into specialty coffee.” He cites small chains such as Caffe Vita and Stumptown as true specialty coffee shops. Ethiopia has a long, rich coffee history. Coffee shops abound in Ethiopia’s cities and towns; beans are still bought green and roasted at home. The lively, highly social two-hour coffee ceremony remains intact. Of all the coffee-producing countries, Ethiopia is the only one that has a higher domestic consumption rate than export rate. This is in spite of the fact that the government has imposed higher domestic prices for lower quality coffee beans, selling the best coffee more cheaply overseas because Ethiopia needs foreign currency. Despite Addis Ababa’s construction boom, most coffee farmers live in poverty, farming on tiny plots of land they can’t own in rural areas lacking infrastructure. Does the growing popularity of Ethiopian coffee in the US actually help Ethiopian coffee farmers? Is the trend helping farmers? Wondwossen Mezlekia is an exiled Ethiopian living in Seattle who blogs extensively about Ethiopia’s coffee industry. Having been trained in economic development, he started blogging in 2006 from Seattle when a public dispute between Starbucks and the Ethiopian government emerged. 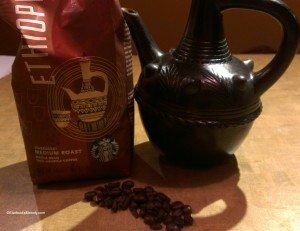 Ethiopia discovered Starbucks had tried to trademark the name Shirkina Sun-Dried Sidamo – a rare coffee – which sparked a dispute, and also led to similar trademark disputes about Yirgacheffe, Harrar and Limu, all coffee growing regions in Ethiopia. Farmers are benefiting slightly from the growing popularity of their beans, Mazlekia says, but government challenges keep them from earning more. A lack of smart policies, corruption and internal government failures all have contributed to keeping most coffee farmers from getting adequate compensation, he says. Foreign buyers don’t have direct contact with farmers to form partnerships. As of 2008, all coffee must be sold via the Ethiopia Commodity Exchange, with the exception of a small number of larger commercial farms and cooperatives. Ethiopian immigrants abroad like Gurmu don’t have an insider track to buying Ethiopian coffee beans. In an attempt to help coffee farmers, Buunni Coffee and others buy Fairtrade-certified Ethiopian coffee. Others, like Royal Coffee’s Bekele, call Fairtrade in Ethiopia a gimmick. Bekele buys coffee through independent exporters that, he asserts, pay the farmers the highest price. Meanwhile, Starbucks uses a sourcing system called Coffee and Farmer Equity, verified by Conservation International. Spokeswoman Haley Drage claims it’s more rigorous than Fairtrade. For many American coffee drinkers, Starbucks is like a security blanket, a safe bet and familiar experience accessible in nearly every city or town. Fans of Ethiopian coffee shops can hope the specialty shops continue to multiple across the US. It’s happening in New York City: “We are ready for our second location,” Gurmu says somewhat majestically, describing a second Café Buunni slated to open inside the mammoth Washington Bridge Bus Station this summer. This Café Buunni will be just two blocks south of the nearest Starbucks. Time will tell if the aromas of Ethiopian coffee will lure fervent Starbucks fans out of their safety zone, giving them courage to savor the Ethiopian macchiato. Starbucks introducing a new Ethiopia core coffee! Starbucks will soon be introducing a new single-origin Ethiopian coffee into their core lineup, officially beginning in October. (You might see it available in baskets before then). I had the chance to try this today (September 9, 2013), with the blend’s creator at the Starbucks headquarters here in Seattle: Coffee Master Anthony Carroll. We cupped the coffee and did a tasting of it from a French press, and then at the end of the event, I tried it from the Clover. Anthony Carroll is a 18-year partner who works on new coffee blend development, and recipe development and maintenance, such as (just for example) establishing the right brew times for coffees to be programmed into the Clover, developing the perfect amount of coffee and recipe for Verismo pods and K-cups, and maintaining the quality and recipes for the all the core and Reserve coffees, and of course, actually creating new blends. We compared House Blend, Kenya, Komodo Dragon, and finally the new core Ethiopia. Actually, when I sat down, I realized that my cupping skills were a little rusty! It had been a while. Anthony talked about the spectrum of roast profiles, with House Blend being the lightest of the four that we tasted and compared today. The new Ethiopia coffee is a medium roast blend. I must say, the time just flew by, just talking with Anthony about coffee. I felt lucky to be able to simply chat with the person famous for creating coffee blends, and maintaining recipe perfect for all the core coffees. Anthony Carroll is also the creator of Thanksgiving Blend ! We talked about that House Blend was the lightest coffee that Starbucks offered up until 1997, when Breakfast Blend was introduced into the lineup . Back to this event’s coffee cupping: there is quite a bit to knowing how to do a great cupping, but the very basic steps involve ground coffee in a cup, with water poured directly over it to brew it. Then you break the crust, skim off the top crust, and slurp to compare coffees. As we talked about Komodo Dragon, I realized that I didn’t know much about that coffee. With the “cupping” method of tasting coffee, you get some of the peppery-ness to the coffee, some of which are introduced by the Sulawesi and Papua New Guinea components. I had the new Ethiopia coffee “cupped,” in a French press, and from the Clover, as I mentioned earlier. The French press highlighted a lot of sweetness to the Ethiopia. When you compare it to the Komodo Dragon (compare via cupping), I notice that the Komodo Dragon is a little more complex and darker, and has more pepper notes. The Ethiopia is stunning. It’s sweet, with a fairly clean finish, and has some cocoa notes, and lots of citrus. 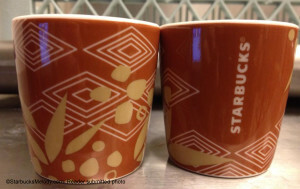 Starbucks has been working with a number of farmers to produce this coffee for them, and will be offering it across their many stores, including introducing it into the Japan market sometime in early 2014. By the way, this coffee is simply amazing from the Clover. From the Clover, this coffee is squarely medium, with tons of citrus flavor, and big mouth-feel. You don’t any milk and sugar! That’s my cup of coffee from the Clover! By the way, as I understand it, the new core Ethiopia coffee will be launched in many international markets as well, though some will receive it later than October. I think during this coffee seminar, it was mentioned that Japan would launch the new Ethiopia in early 2014. So have you tried the new Ethiopia coffee? What did you think? Portland’s first shipping container Starbucks is now open. Cold Coffee that Tastes Like Whiskey. I can’t wait to try it! These sort of launches make me miss being a partner, and being a coffee master. It’s nice to see a core coffee launch, rather than yet another new handmade beverage. We have had this coffee in our stores in Europe since a couple of weeks and in most stores it is actually avaialble as ‘Origin Espresso’ – people can choose it for their espresso beverages instead of our Fair Trade Espresso Roast. The Ethiopia is great as espresso – a bit milder but still stands out very nicely when combined with milk. I think the citrus is less present in the espresso but you get more of the dark chocolate and peppery notes. @Melody – Great post. 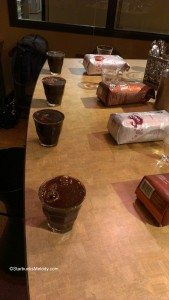 Wish a store in my town would offer tastings, including cupping. I am really excited about this new ‘release.’ I am sure I’ll love this coffee. I plan to go try it tomorrow. Hopefully my local store will have the tasting cup available as a gift-with-purchase on Sunday. Although it is quite likely I’ll be met with a blank stare, I really hope not. P.S. I finally got my Anniversary Blend tasting cups in the mail today. I was just waiting to see how long it would take for you to do a thread on the Ethiopia. I have tried it twice, and I like it. I wish they would return some of the old core coffees or add more new ones. The flavors as you describe are spot on. The only thing that always drives me crazy about Starbucks is how freshness of coffee is so important, yet it sits delivered sometimes 2 weeks early sitting in the back somewhere. How long does it sit before it is delivered after roasting? If they can get a coffee into stores that early, why not launch it sooner? It’s sitting there doing nothing. IMO – the fresher it is when you enjoy it, the better. When you see it in stores next week folks…… Enjoy! Our local store is actually doing a tasting on Sunday! The postcard with the information says they are giving away the tasting cups (while supplies last) with purchase of a 1 lb. bag of the Ethiopia coffee. I appreciate everyone’s comments – have to run right now. I know that this coffee has been available in Europe for quite sometime as a single origin espresso – I wonder what readers think of the new Ethiopia as an espresso shot? I tried a French Press the other day. SO GOOD. I’m really excited that we’ll be getting an Ethiopian coffee back. (Ethiopia Sidamo was one of my old favorites). I bet the Clover of it was fantastic, though! What a great experience to taste it with Anthony! It is perfectly suited for my taste preferences. I like cocoa flavor, I love medium roasts, and I adore Ethiopian coffees. A new favorite! So excited that you get to attend things like this and so thoroughly report them! Thanks for the post Melody, I am looking forward to doing my own comparison with Komodo (my fall back favorite). Like @Chgo. I am a bit miffed when a perishable product like coffee is allowed to sit in the back room for weeks. @DadCooks – Your comment made me think of the failed attempt at the 2013 Kona. It was delivered early, then sat in stores for almost 2 months???? During that time they were trying to decide what they were going to do, but my understanding was that during that whole time, it stayed in the store. I was pretty sure it was never going to get sold, but what if they did give it the green light after all that time, considering what Kona cost? I have never seen a Reserve discounted that I can think of, at least not in a Starbucks Store. I guess 2 months isn’t bad, but for what Kona cost, how would they have justified charging full price? I know this isn’t a bold coffee, but I would say it’s on the bolder side of a medium IMHO off the Clover. When I’m not drinking a Reserve, I’ve been drinking a lot of Kenya lately. I like this Ethiopia coffee a wee bit more than the Kenya. I am so jealous! I wish I lived closer to Seattle and had the incredible fortune to get picked to do this kind of stuff! It makes me a little sad on the inside when I see through social media the kind of unbridled, amazing enthusiasm other regions of the country have when compared to my own. I truly wish the stores and partners in my area would get a little riled up and excited about all of this! I can’t wait to get the tasting cup for Ethopia! (I got my Anniversary one a week ago). I’ll be getting up early on my day off but it’ll be worth it. It’s rumored (though they have yet to arrive) that partners will receive special pins (in the shape of the Ethopian jabena from the coffee ceremony) to wear for the launch. So excited! I already got one of the pins! Our store manager gave us the Jabena pin after tasting the Ethiopia. @Claire – I love it when partners are all excited about new coffees too! I will say, this particular kind of invite, as in this article, really is related to the fact that I have this blog. @Chgo – I had a cup of it again tonight – from the Clover. This is a great coffee! It’s medium-bold (imho), and is perfect from the Clover. The barista who made my coffee was telling me that when he tasted Ethiopia side by side with Kenya, he thought the Kenya was a little thin! @Aymee – Saw those pins today!! All I could do was ooh and ahhh over them. Oh by the way – For anyone interested, if you are an Instagram user, you can find me as “starbucksmelody” on Instagram now. Sbux had this out in a basket in a store that I stop by ~ once/mnth…on my way home from an appnt. This is a great!!!! little store, in an industrial area. (for anyone around me ie: @chgo) it’s the Elk Grove store on Rt83 and Landmeir. (?? ?weir, I never remember). The partners are excellent, their remodel a yr or 2 ago was EXCELLENT! and they have retail stuff I don’t see everywhere. Anyway, I commented about the “Ethiopia” and we talked a little about it and they gave me about enough to make a pot for this morning. I was guessing I would probably like it and wow! I think it is REALLY really good. might even be 2nd to my most beloved Ethiopian Yergacheffe….which most partners don’t even know. In any case, I will buy this coffee as long as I can and am really glad they didn’t put it out as a Reserve. Am hoping they serve it next week. Soooooo good, so smoothe and still so flavorful. I’m about to head out to my regular store..will be interesting to see if they have it out yet! Highly recommend this to all coffee lovers…..give it a try. @Denise – They had it in the basket at PR today and I had one on the Clover. I’m happy to have this added as a core coffee. You know what? I go to Portillos for lunch every so often, and pass that Elk Grove store all the time, but I have never gone in there yet. BTW- It’s Landmeir. sorry a little off topic. @chgo: that is really a great little store…I wish it were just even a bit closer to me (w/out having to bypass ~ 6+ other Sbux to get to it;). Check it out…you know I would never steer you wrong…one west-sider to another! and, back on-topic, they had the Ethiopia in my regular Rand Rd place, too. So, it’s out around here! I was past the time limit (whoever thought Sbux would have such a thing?) for “dark” so they had to make me a pour-over today. This was a fairly new partner and I asked her (she likes ‘dark’ too or, as I still like to say: BOLD) if she could make my pour-over from the Ethiopia. They didn’t even have an open bag but she gladly grabbed a lb and very sweetly obliged me. It’s the little things more often than not. and, on that note of sweetness: I’d bought 2 of those double-walled new Siren drinking glasses when they 1st came out (where is that Anniversary tasting cup anyway??? seems I should have it by now!). Anyway, along with a couple ‘old Siren’ drinking glasses from quite a few yrs ago (late ’90’s?) and a few “Shamrock Shuffle 8k” glasses with a couple different yrs on them, I really liked those glasses. So, like everything this summer, one was broken by a friend about a month or so ago. I put out the word to my sm, dm. I said I’d like to buy two, if they ever came across them. A couple weeks ago I got an email from our dm telling me she had 2 of the glasses for me and was dropping them off that morning at the Rand Rd store. When I picked them up, no charge, no money. They were just an act of kindness for me! Of course, I emailed everyone with gratitude! I never expected not to buy them. So, like I said: it’s so often in the ‘little things’! as a very-much-aside: along with SO many things somehow getting broken in my house this summer, went my really really special “mystarbucksidea” cup, as seen in gravatar. That was almost the worst, in the scheme of small-material-things. I loved that cup. I did write to Cecile but don’t expect it to be replaced. Just putting it out there…in case anyone has an extra one, or knows of one? I would so love it…. and now, I’m done with this long essay! 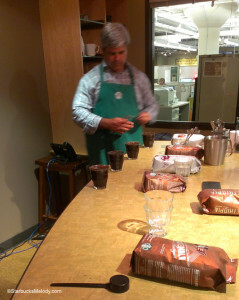 We had a coffee tasting of the Ethiopia roast at my Starbucks store using the French Press. I was so impressed by this coffee’s rich velvety smoothness and quick finish that it has now replaced Sumatra as my new favorite core coffee from Starbucks. It is a full body coffee, with hints of coco and citrus. We paired this roast with Starbucks iced lemon loaf as well as Starbucks double chocolate brownie. The lemon loaf brings out the citrus flavor, while the brownie brings out the coco flavor. A bite of the brownie with a sip of the Ethiopian roast taste just like a mocha beverage. I definitely will not have to add cream or sugar to this roast, and will enjoy pairing it with a chocolate dessert from time to time. I’m looking forward to trying Ethiopia from the Clover and comparing it’s tasting characteristics with the French Press. I wish I had something new to add to the discussion, but like most of the comments above, I really enjoyed this coffee when I tried it. I participated in the virtual coffee tasting on Monday and paired this coffee with LB Chewy Chocolate Meringue Cookie as well as the LB Reduced Fat Lemon Loaf. It’s amazing how this coffee can be all cocoa and spice when paired with chocolate and then the coffee can be all citrus when paired with something like the RFLL. I am very excited to have an Ethiopian coffee back in the core coffee line up. Personally, I really miss Organic Shade Grown Mexico and while the roast profile of this Ethiopian coffee is more aggressive than Organic Shade Grown Mexico, this Ethiopian hits a balance of cocoa, citrus, spice and mouthfeel that I found so enjoyable with the Organic Shade Grown Mexico. We haven’t received our tasting cups yet so I am really hoping they are in our RP order this Friday or else we are going to have some upset customers. I checked literally over a dozen locations, and when I asked, I’d say only three knew of the tasting Sunday. Most responses I got were it’d be brewing starting Oct. 1, 2, and even the 15th. A couple of partners were unaware of the tasting cup gift-with-purchase. Sigh. -I’ve tasted coffee with Anthony and 13,000 other people, not that intimate. Melody I am sooooo jealous of these personal Starbucks moments that you get…as a nearly 10 year partner who is very coffee/company passionate I’m constantly in awe of the doors you peek behind. I’m happy that you ask questions and include us. -Tomorrow is Coffee Day! We’re celebrating by offering samples of the Ethiopia all day. At my store we’re going to brew it instead of Pike and then offer presses throughout the day. I liked the coffee, and in general I’m an Indonesian first kind of girl but the pepper grabs me. Much like the Chocolate Chai it’s the pepper that comes out the most for me. -About the tasting cups: At my store we received 16 cups and the directive was that they are to be given away to the first 16 people that buy a 1lb of Ethiopian coffee. Becca – Thanks. I don’t know what to say. I do appreciate this intimate moments with the SSC. As for tomorrow’s sampling day, I definitely am in! I might drive to a brand new Starbucks in Tacoma tomorrow and check out their sampling. (A new Clover store that I have wanted to write about on Bridgeport & 40th in Tacoma). I debated a lot about what to write for tomorrow. It was also September 29, 2009 that Via Ready Brew was officially launched nationally, so tomorrow is Via’s 4-year anniversary. I had thought about wrapping that into an article. But honestly, I doubt I will have something ready for tomorrow! I just baught a pound of this and just finished a press. It’s absolutely awesome! It’s the best Starbucks coffee I’ve ever tasted with the Kenya coming a close second. I just wish the roast would be a little lighter so the juicy citrus would shine a little more. NOTE: The tasting cup gift-with-purchase is now available online, too. Melody, I tried the Ethiopia blend this morning and enjoyed the taste very much. I find it’s pretty smooth. I think the citrus notes do take a back seat. I read in the post above that Komodo Dragon was involved in the tasting you attended. I must say this is one of my least favorite coffees. It hit me this morning while out getting my coffee that it wont be long and I can get my beloved Gingerbread Latte (I sure hope it’s returning). Oh yes, and red cups!!!! @Monica – I think the Gingerbread Latte usually appears sometime in November (maybe late Oct?)? I imagine it is coming back! I have a hard time imagining that they’d axe it! @TheKwan – Thanks for the link – I am a little worried of stores selling out of the tasting cups fast. I am tempted to be a pound online just to be sure that I get one. Tempted anyways. It’s only 6 am here in Seattle, so I haven’t been into a Starbucks yet. @Melody: (funny re FB timing of our comments) so, just to share, yes, I did get this Ethiopia tasting cup this morning but as I was writing on FB, too many partners seem to be totally unaware about the day, the coffee, the cup. They may be relatively new but, it’s ultimately up to Corp. (and all the sms, dms etc) to keep them informed…all of them! I do not feel it should be up to us, as customers, to keep them aware….especially when there are signs and cards etc all over the store. Is no one paying attention anymore??? You wouldn’t know from the (Reserve and Clover) store I visited today that it was National Coffee Day. 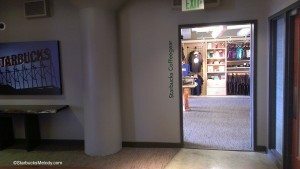 No signage or chalk art, no pot or samples at-the-ready by the counter. The good thing is the partners did know about it once I asked, and poured me a generous sample in a short cup. Out of 10 tasting cups they received, they had four left (kept behind the counter, out of sight). I definitely like the Anniversary tasting cup more, but am happy to have this one too. Oh, and I love this coffee. 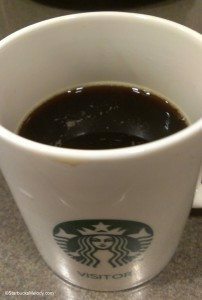 @TheKwan – Even if the Starbucks headquarters sent me a tasting cup, I’d still be buying the coffee! I went to two Starbucks today: One in Tacoma and one in Seattle. The one in Tacoma had plenty of tasting cups, but literally NO one pound bags of Ethiopia. They said that had not been shipped any. It was weird. They seemed surprised when I said I wanted to buy a pound of it. They scooped a pound out of their 5-pound bullet of Ethiopia, and so I did finally get my tasting cup – and I clicked through the link you gave and bought a pound, just to be sure that I would get one. And I love this coffee too. As for driving business to Starbucks, I’m sure I drive a little business here and there. I suppose it’s a nice incidental fact of this blog. Tried it today in my store. Somehow was very surprised when I first poured the coffee out of the press – very distinct peppery aroma. Wasn’t as florally and citrusy as I expected- More on the subtle parts though. Cocoa was the obvious note here to me. 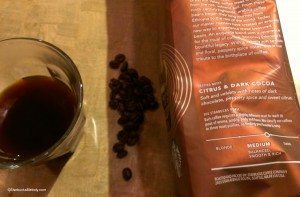 As the roast is more on the darker side of medium, I guess the citrus part of the coffee really took a backseat as mentioned in some of the comments. Had some chocolate with fruits and nuts inside to go with it- Now that really brought the coffee up to a new level. I’m sure this is a better coffee in a lighter roast. Dark brown is typical of Starbucks. Would have loved this in a medium brown where more of the citrus and berry characteristics from its promising origin would be discernible. As it is, not bad. Could be better. You need to offer the ethiopian coffee in smaller bags. Maybe a 6 oz bag instead of the 16oz. Favorite blend of coffee! French Press / Ethiopia every morning to get going! I tried the Ethopian blend, love it, didn’t think I would. In a short time became addicted to it!! However, there’s not a Starbucks store I can get it at anymore…. Just bought a cup made on the Clover, hoping it would turn out to be a rebranding of the old Ethiopian Sidamo, my all-time favorite Starbucks coffee. I’m no coffee expert, but if you told me it was, I’d believe you. At a minimum, I would be shocked if there wasn’t quite a bit of Sidamo in the blend. And I see that Starbucks is now selling organic Sidamo for $30/lb. I’d say this one is close enough for me at $14/lb. This is my new go-to Starbucks coffee. Eliza Jane Turkington on Register Your Starbucks Card: Your Free Birthday Drink.